It has taken me a few decades, but I finally figured it out. The source of all my wisdom? Personal experience, heavily supplemented by newspaper advice columns, my internet forays, and especially Buddhist Boot Camp, Timber Hawkeye’s wonderful site. We pile all these unrealistic expectations on to ONE day. It has to be perfect, perfect food, perfect gifts, perfect decorations. We create this made-for-TV movie in our heads, and expect that others will be performing their roles exactly as expected. Because, of course, everything is perfect at everyone else’s house. Isn’t it? We are a mobile society. Not only do we move geographically–we also “move” relationships. 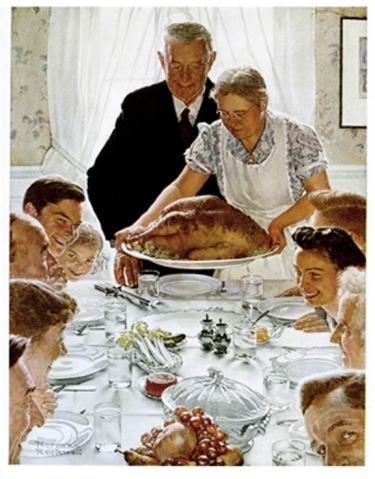 Divorce and remarriage adds a level of complexity to family gatherings that didn’t exist when Norman Rockwell was painting his holiday scenes. These days, how likely is it that ALL family members can be happily present at the same dinner table on the same day? Coming from a fractured family that is geographically challenged, my answer is “halfway between impossible and improbable”. Oh yeah. So why not have MULTIPLE gatherings? Why not just rejoice in the time you have with your various family members regardless of when they occur? Why does Christmas have to be just on December 25th? Stores start decorating around October 31st. Rather than being upset by the crass materialism, why not look at those early decorations as a reminder of the SPIRIT of Christmas (or Chanukah or Kwanza or whatever floats your boat). If Christmas to YOU means kindness, appreciation and love, why not just SHOW that kindness/appreciation/love in some way, to someone important to you. It doesn’t have to be on December 25. It works just as well on any of the remaining 364 days. If Christmas means something else to you, then by all means, follow your own particular definition, which I hope doesn’t make you miserable, frantic and stressed out. This year, my “Christmas” started on December 16 when we met my dad and his wife in New York City. Our present to them was tickets to the show at Radio City Music Hall. Their arrival was a comedy of errors, including, but not limited to, a forgotten cell phone, late bus and lost luggage. What I’ll always remember, however, is my dad’s good humor throughout what could have been a stress filled fiasco. His wonderful ability to roll with whatever may happen is one of the many reasons his kids are all crazy about him (or maybe we’re just all crazy–one or the other). Thinking back on those two days, I’ll also remember my wonderful husband’s support and assistance during the entire visit. THAT was the best Christmas present he could have given me. With a large family on both coasts it takes a while for us to connect with everyone. And that’s okay. To me, what matters most is not what is on the calendar, but what is in your heart. So, take a deep breath, smile, tell yourself it will all be fine, fully enjoy whatever comes your way, and be kind to yourself and others. Amen, Shelley! Thanks for reminding the “stressed out” me to cool it! Merry Christmas to you and Mike. Right back at you Debby! I hope you and Lawrence have days that are merry and bright! Be sure to let me know all about your upcoming OATH trip! I’ve always wanted to go to New York City around the holidays – the pictures make it look so beautiful. It sounds like you had a great time! Learning to roll with the punches – at this time of year especially – really makes life so much better. Sometimes we need to remember to just breathe. 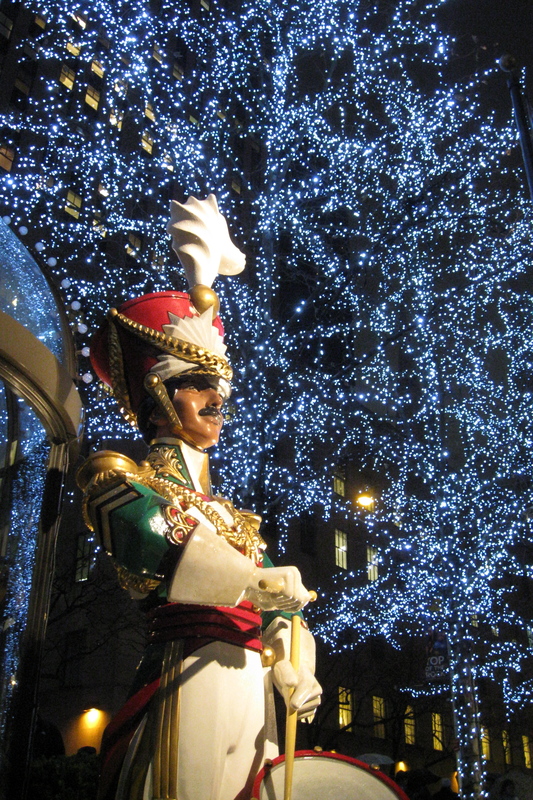 Yes, NYC is a magical place, especially during the holidays. Now that you are a retiree, everything is possible! Moments of peaceful awareness become cherished memories. Merry Christmas to you and your family! Thanks for your kind comments. And thanks again for helping me to connect with Karen P.
You continue to dazzle me with your impressive wit, humor and sage advice. And to prove my point I am actively listening to your words of wisdom with a glass of wine in hand as I laze in front of a crackling fire. Merry Christmas Shelley and Mike! Looking forward to biking with you in 2015! Whoops! I am not anonymous! I should have signed in first. Underneath those long robes and turbans, who could tell? Shelley – I’m so glad you were able to enjoy a New York holiday in spite of snafus. If we could start every December with good reminders like your post, we might not put so much pressure on ourselves to expect relationships and gatherings to be anything other than what we/they are. False expectations and willful denial just lead to misery. Glad to hear from you😊. I’m a bit under the weather this week so am resting and hoping it is a fast recovery! I hope you feel better soon. I’ll be watching for your posts. we are headed out to California to spend two weeks with our son. He isn’t married yet, but when he is, we won’t ever make him feel guilty if he doesn’t spend the holidays with us. Any time with him is special! So glad you posted again, Shelley, with these timely thoughts. My persistence in checking your blog every week has been rewarded — a wonderful present to open next to my tree this morning. Thank you. An unexpected bonus was the acquisition of Blogging Buddies, like you. And that has become the best part.